To deliver this witch doll cake I had to travel by bus for around ten hours with my five year old daughter, which was definitely an interesting experience. My niece (the recipient of the cake) lives in the northern part of our state and we live in the southern part. 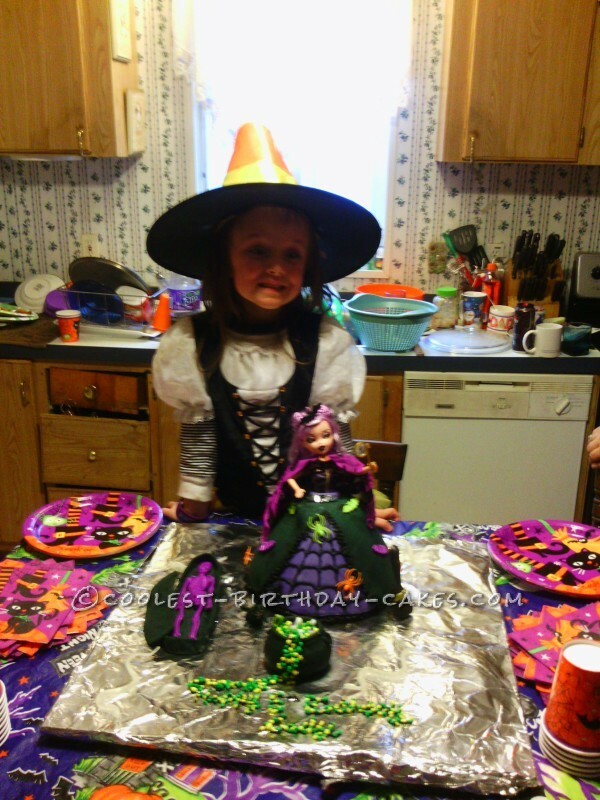 Being her mother’s daughter she loves all things Halloween, so every year she picks Halloween as her birthday theme. That works out well since her birthday is right before Halloween. Also, every year she wants Aunt Sarah (that’s me) to make her cake. To make the cake I used a vanilla batter, divided it up, and dyed it purple, orange, and green. Then, I layered the colors creating a tye dyed effect. Once the cake was baked and cooled, I frosted it with chocolate frosting dyed black. That’s the best way I have found to get a really good black. Nex, I rolled out the black fondant and covered the cake. I guess I didn’t knead it well enough because it tore in several spots which was pretty frustrating. After that I rolled out some purple fondant and cut a triangle, placed it on the front of the cake, and iced the spiderwebs in black. Then, I used the ribbon tip to ice the edges. 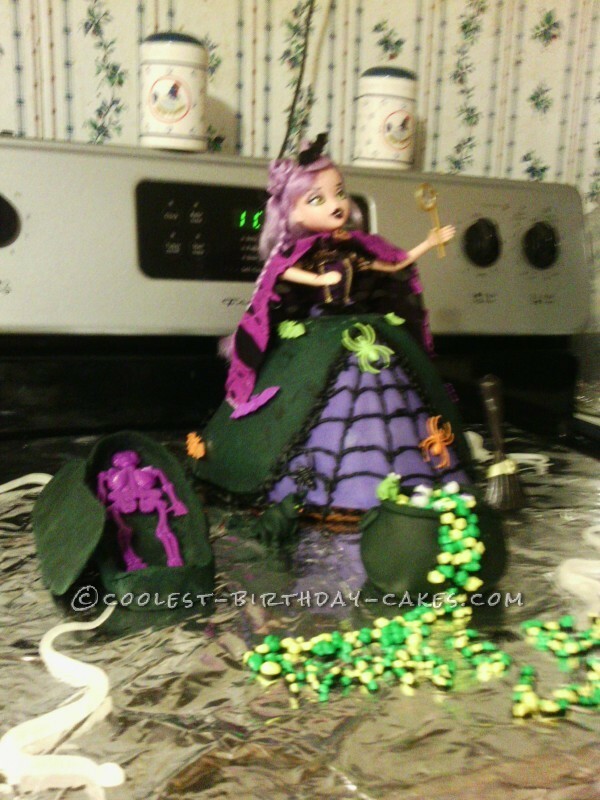 Next, I placed the Bratz witch doll down in the cake, I used the original top that she came with as the top of the dress. For the belt I cut a strip of fondant and wrapped it around to bring it all together nicely. I used spider rings to decorate the webs and I decided to use bat rings to decorate the rest of her skirt. That worked nicely to cover the tears in the fondant since they just happened to be in the right direction. The tears also made it easier to push the rings in. I used the ribbon tip to go around the very bottom of the cake to finish it off. 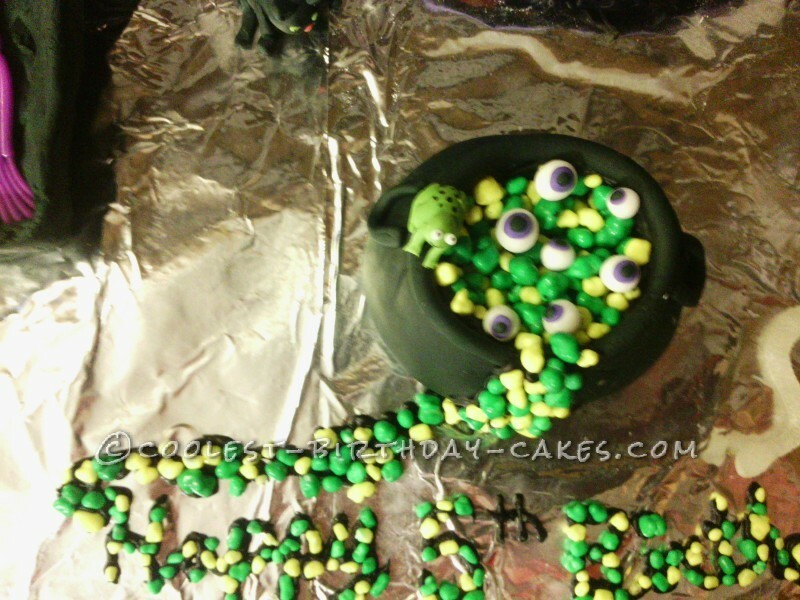 I decided to make a cauldron of eyeball stew to go with the cake, and after a lot of searching for ideas I decided on green and yellow nerds for the bubbles. I made the eyeballs out of fondant. I also made a kitty because, lets face it, every witch has to have a kitty. The skeleton was a leftover party favor so I made him a little coffin. The broom was a brush that came with the doll. Making this cake was truly a great experience and I can’t wait to make the next one!